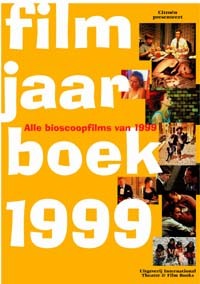 The annual publication of the "Filmjaarboek" has reached the bookstores once again, this time covering all films distributed in Holland during the period 1999-2000. This twentieth edition includes, as usual, the titles, actors, and technicians connected with each respective release during the past year along with a short synopsis of the content of each film. (The film summation often contains the reflected opinion of the journalist -27 in all- encapsulating it.) The information also includes: the date of release in Holland, the cinema in which it premiered, the countries by which the film was produced as well as original year of production, the length of the film, the production company's name, the film distributor (& video distributor) in Holland, number of viewers attending each film during its release period, and the number of copies distributed in Holland. A review of the year by Jan Heijs gives a short summary of events and high points in the cinematic scene at various European Festivals, ending with a summation of Holland's own Rotterdam Film Festival, Amsterdam's International Documentary Film Festival, and, naturally, Utrecht's Dutch Film Festival with its special Gala for the first century of film. A listing of award winners at various international festivals follows this. Packed with information relevant to activities in the Dutch film world, the 20th edition of this reference work includes a number of tantalizing extras. A special appendix, for example, lists the directors of all films distributed in Holland over the last decade. An audience attendance chart will also be of interest to those curious about the pulling power of different films for Dutch audiences. Also present are two articles related specifically to aspects of film in the Netherlands. The first, written by noted journalist and writer Henk van Gelder, offers an encapsulated history of film censorship as exercised in Holland. This makes its appearance at a most appropriate time when the now-operative rating system is coming under discussion and could quite possibly be dispensed with in the near future. Among the events cited in this interesting and anecdotal essay is the banning of Buñel & Dali's 1929 film "Un Chien Andalou" as well as the release (and major breakthrough on the side of filmmakers) of Wim Verstappen and Pim de la Parra's 1971 film "Blue Movie" (wherein the main character sports a full erection while making love in an elevator). This last film was, to the surprise of many at the time, reassessed by the Board and finally accepted for release because "despite very bold, challenging, and shocking images of sexual union and genitalia (-it-) cannot be judged in stride with good morals, because, viewed in its entirety, the movie takes a standpoint proposing an intelligent and nuanced approach to sexuality." Yet another section of the article mentions the banning of Mankiewicz's "Guys & Dolls" (1955) because some members of the Salvation Army are made fun of. Satire doesn't sit easy in Holland, but read the article for yourself and get all the details. The second essay, written by "Financial Daily" editor Hans Hoes, discusses various financial measures and tax incentives instituted over the past few years to stimulate the making of Dutch films as well as analyzing the benefits reaped during their initial phase. Arguments both for and against are compacted neatly into a concise article that is accompanied by a charted list of productions realized during 1999. The pros and cons may still be confusing to those not very financially or managerially minded, but the plus points remain outshining previous alternatives. (It is a quick butterfly in the darkness of night that manages to get the best deal.) Hopefully, the future will provide the viewer with some artistically agreeable results from this newly evolving system. The Uitgeverij International Theatre & Film Books publish this volume, edited by Hans Beerenkamp, Harry Peters and Gerwin Tamsma. Citroën Nederland and the Stichting Nederland Fonds voor de Film have sponsored the publication. Published in a handy format, there is easily a place awaiting it on the cinephile's bookshelf. One word of warning, however, to those unfamiliar with the Dutch language>> there is no English translation available at the moment for the texts found between its covers. Begrijp je wat ik bedoel?